The University of Manitoba Faculty Association (UMFA) and the University of Manitoba have reached a tentative four-year agreement following expedited bargaining sessions over the summer. The tentative agreement was reached after UMFA sent an expedited offer to the U of M administration outlining four proposals considered the most important to members. The proposals include job security for librarians and instructors, and workload protections for librarians. A one-year agreement reached after a 21-day strike in November, 2016, saw librarians and instructors receive less protection than professors against layoffs. The agreement also lacked provisions surrounding workload protection guidelines for librarians. The new proposal also includes staffing agreements and salary increases. “We wanted assurances that the university would hire [and] would replace any professors that left over the term of the contract, and we wanted some salary increases,” UMFA president Janet Morrill said. “We ended up with a settlement that has increases that are consistent with the PSSA,” she said. The PSSA, also known as Bill 28, was introduced by the provincial government in March and a framework for public sector employees to negotiate new contracts and compensation increases while ensuring long term viability of public services in Manitoba as existing contracts expire. The first year of the contract will see no salary increase. The second will see a 0.75 per cent bump, followed one per cent in year three. Salaries for the final year will be negotiated in year four. According to Morrill, the discussions were intricate. “The interference from the government in these negotiations was substantial […] That level of interference in the last round and this round was something I have never seen before,” Morrill said. 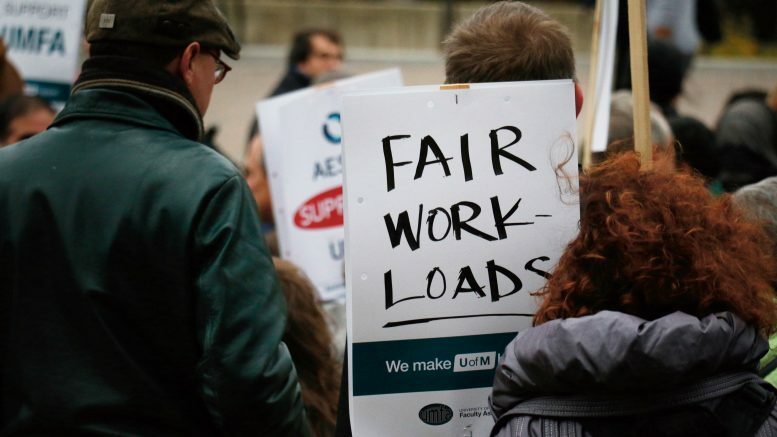 Shortly before bargaining collapsed leading to a three week strike in the fall term in 2016, UMFA and the university issued a joint release critical of provincial interference in the negotiating process. After faculty had rejected a previous four-year offer that included salary increases, the province directed university administration institute a compensation freeze. The strike came to an end in late November after the two sides settled on a one-year contract that did not see a salary increase, but did include workplace protections including workload, job security, and performance measure provisions. Tanjit Nagra, president of the University of Manitoba Students’ Union, said she is happy to hear an agreement is at hand. Nagra added that if the membership approves the tentative deal, it will ensure stability for the upcoming 2017-2018 academic year. Morrill said any long term agreement, especially when salaries are not freely negotiated, has associated risks but they have to be balanced against the gains. “There are always risks in signing a long term deal and that is just one of the things that you take into consideration,” Morrill said. The agreement has yet to be ratified by UMFA membership. A date has not yet been set for a ratification vote.